Impressed with the look and price of this runner. It's just like the photo. I would recommend a nonslip grip underneath. Inspired by colorful motifs and alluring patterns, Adirondack Rugs translate rustic lodge style into supremely chic, easy-care floor coverings. Made using enhanced polypropylene yarns, Adirondack rugs explore stylish over-dye and antiqued looks, making a striking fashion statement in any room. I wanted new rugs in foyer and couldn't decide to go with colorful or more single tone. The hall walls are yellow and I have some teal/blue colors already. I bought this rug and another Safavieh rug that was very colorful. This rug fit the bill but I ended up keeping both. I always like Safavieh rugs because they are quality made. Love this rug - I needed something that was the right length and also not outrageously expensive to use in our walk in pantry -- this rug is both, it is long, super soft underfoot, and the price can't beat! The contemporary vintage look goes great and ties in well with the overall décor in our kitchen. Recommend for sure. 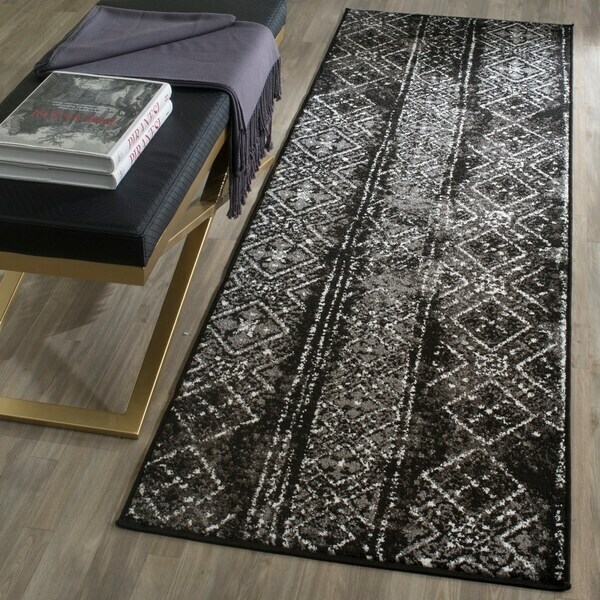 I love the vintage style of this rug and you can't beat the price! I added a felt pad (also purchased from Overstock) and the rug is soft, comfortable and doesn't slip I'm my long hallway. This rug looks pretty cheap and it was pretty cheap to buy. The pattern is printed right on the pile. The texture feels a bit plastic-y. But for the price it works for a floor covering that take a lot of beating. Hides dirt, vacuums easily and resists stains, though does show light colored dog fur. Needs a carpet mat underneath to keep it from sliding. I thought that this run would be as thick and luxurious as a previous safavieh rug I had purchase. This is a pretty thin rug. It's still pretty, and looks nice as a runner, but it doesn't provide a whole lot of cushion for your tootsies. The second I saw this area rug, I knew I needed it. it was exactly the look we have been looking for. And it does not disappoint in person! It is beautiful! decent rug. not the thickest I've received from overstock, but great price for quality. I love this rug! Looks just as pictured, gets lots of compliments. I give this a poor rating only because I received the wrong size rug and had to return it. I recommend spot cleaning this rug using no harsh chemicals. Love the dark colors to go with my white furniture. So super chic! I love the design and I believe it will fit nicely with my colors and overall floor design . The intent is to place the item near the front door.